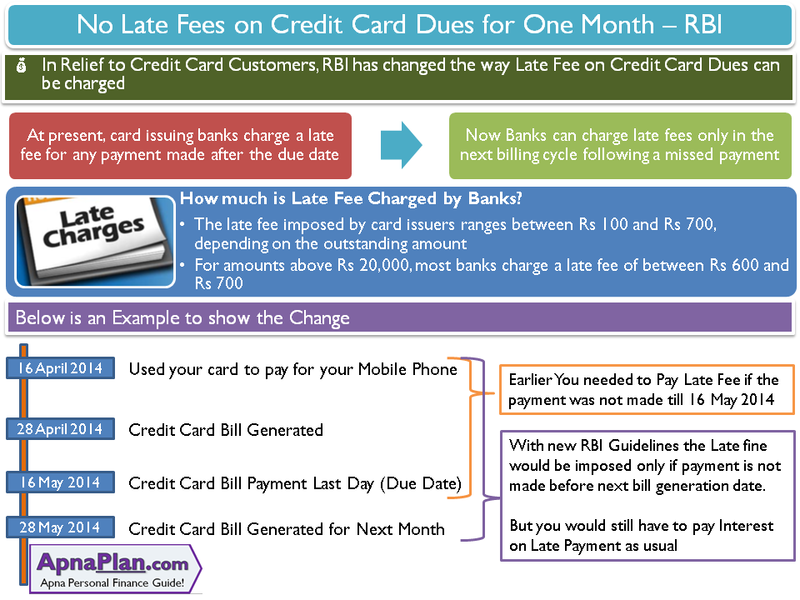 In major relief to credit card users Reserve Bank of India (RBI) has changed the way banks charge late fee on late bill payment. What do banks charge if you pay late? 2. Late Interest Payment – the banks also charge a interest on the late payment. This interest rate is varies from 2.5% to 3.5% per month (or 30% to 42% per year) which is huge. Until now banks charged Late Fee if customers did not pay till due date but with the new direction from RBI, late fee would be charge only if the customer does not pay before next bill generation cycle. This effectively means that you got extra 15 days grace period for Late Fee. The picture below shows how the new system would work. How does Late Fee for Credit Card Works? The bad news is banks would still be charge you late payment interest if you delay your payment beyond their due date. This is a good consumer friendly move from RBI as credit card providers anyway charging exorbitant interest charges for delay payments. But as a customer you should always spend with in your limits and pay back within due date. Carrying debt on credit cards is the worst kind on loan and should be paid off as soon as possible. I’m a victim of low cibil score.i took personal loan 42000, 8 yrs ago,paid 9 installments.Later due to some losses and poor financial back ground, couldn’t able to pay.Now i approached bank to pay the total amount 42000 to bank, but they said i need to pay 140000/- this includes late charges.I took a very small from bank which is 42000 but bank asking me to pay back the amount which is almost 4 times of the principal amount.Any advise on the situation and suggest me how to improve cibil score. Negotiation is the only thing you can do! Once you pay it off and show consistent payment behavior across all your loans, the credit score would improve automatically. Remember there is NO quick fix to credit score. CIBIL score is definitely important but you can borrow even with poor score. You can look for Gold Loans or any other loan where you can put something to mortgage – like loan against fixed deposit etc. do you have RBI Circular no.???? Can the relevant RBI circular furnished?